Explore the media created especially for Essentials of Cultural Anthropology, 2e. Ken Guest brings an anthropological approach and an analytical eye to familiar examples, challenging students to rethink aspects of everyday life that they might take for granted: Are there more than two genders? Do white people experience race? What defines a family? Students can practice using their anthropological toolkit in the accompanying Coursepack, which includes engaging and pedagogically useful documentary film clip activities and exercises. For Guest, globalization is a key force in today’s world, one that is reshaping nearly all aspects of life everywhere. Guest puts every concept in the context of global change. These concepts are key to each chapter and are not relegated to feature boxes or the back of the book. 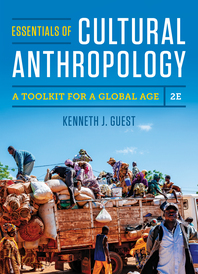 The text presents anthropology as a set of tools for both research strategies and a set of practical ideas that help us better understand and engage the world around us. The book’s unique chapter structure and the accompanying Fieldwork Journal strengthen this approach. The NEW InQuizitive course helps students understand the basics and come to class ready to discuss cultural anthropology’s core concepts. Ken Guest believes that tools for living in a global age should be affordable to all. Unfortunately, most of our competitors seem to disagree. Essentials of Cultural Anthropology is one of the least expensive books for the course. You can add additional value by packaging the Cultural Anthropology Fieldwork Journal for free and adding our reader, Cultural Anthropology: A Reader for a Global Age, for just half the price of the standalone reader.